Kiwifruit are the first representatives of the genus Actinidia to be domesticated and the most recent fruit to be globally commercialized. 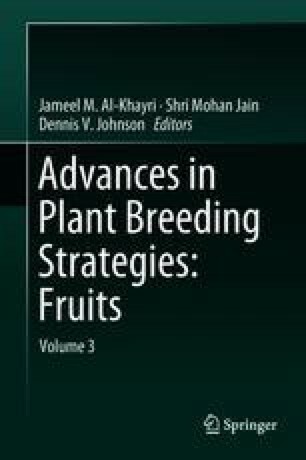 They present challenges to breeders and orchardists due to long juvenility, dioecy, high heterozygosity, multiple ploidies and climbing growth habit. The first cultivars were selections from the wild or open-pollinated varieties but, since breeding began in New Zealand in the 1970s, progress has been made in several countries. Yellow-fleshed and red-fleshed kiwifruit are now found alongside the original green-fleshed varieties. Global production has increased significantly in recent years, as have the number of cultivars available in some countries. However, many commercially important and globally distributed Actinidia cultivars remain vulnerable to the bacterial canker of kiwifruit pandemic caused by Pseudomonas syringae pv. actinidiae. The molecular genetics revolution is poised to accelerate the development of new cultivars now that the Actinidia genome sequences and low-cost genotyping are becoming available. Conventional breeding is already augmented by marker-assisted selection and now genomic selection will be applied in kiwifruit and their smaller berry-like relatives. The results will soon provide consumers worldwide with a range of appealing flavors, colors, health benefits and fruit formats from the Actinidia genus. I thank Ross Ferguson, Paul Datson, Ron Beatson, Stuart Kay, Catherine Langford, and Sarah Knowles for improving this manuscript. The support of the Institute of Plant & Food Research New Zealand is acknowledged. The following is a list of Actinidia cultivars mentioned in the text and/or of significance. A fuller treatment of characteristics, cultivation techniques, and other details can be found in Huang (2016a). There is little information on the under surveyed diversity available in China or the contents of repositories, botanic gardens, and private collections around the world.